Ookbee Buffet Grants Unli-Access To FHM Philippines And Other Top Magazines! Four words: All. You. Can. Read. Digital bookworms, we've got G-R-E-A-T news for you! 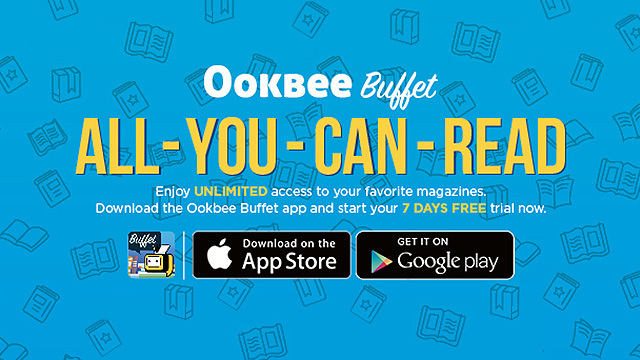 Ookbee Philippines, the company behind the popular Pinoy e-bookstore Buqo, has just released an app that will satisfy all your virtual reading desires: Ookbee Buffet. Four words: Read. All. You. Can. Yep—with Ookbee Buffet, you'll have—get this—unlimited access to a ton of content which includes digital versions of some of the biggest local magazines and even international editions of popular glossies. How does unli-FHM Philippines sound? Or #basapamore moments with Yes!, Top Gear, and Men's Health? All that and loads more with the Ookbee Buffet app! "A lot of our fellowmen, even genuine readers, are still reluctant to purchase and read content on mobile. Hopefully, through Ookbee Buffet, we can urge readers and consumers alike to try out e-reading, allay their fears, and ultimately change their mindset regarding digital content consumption," says Chad Rosario, Deputy General Manager of Ookbee Philippines. However, as with any buffet, this one doesn't come free, hence the million-peso question: How much? No need to count your savings or rob a bank, lads; Ookbee Buffet's unlimited reading offer is available for only P179 per month! A legit bargain considering the sheer amount of content (over 100 different titles, yo!) you can access with it. Interested? Then head over to the Apple App Store (for iOS) or Google Play (for Android) to DL the app now for free and be on your way to being more informed, updated, and entertained.